This is a graph that is readily available on the internet. The top graph (blue) is CO2; the red graph is temperature and the green graph is methane. This a plot of this data for 400,000 years. Don’t ask me how they knew the concentrations of the carbon dioxide, methane and the temperature even 200 years ago. This is the data from which all of the global warming claims have been made. 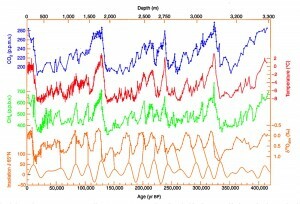 There is a consistent trend in all three graphs: there is a spike about every 100 to 150 thousand years. There is another consistent trend in these three graphs: methane appears to spike before the temperature and CO2 spike. More importantly, the CO2 levels rise/spike to the highest level after the temperature spikes. The CO2 levels estimated at the current time are not much higher than the estimate for 140 thousand years ago and is below the estimate for 340 thousand years ago. The scary graphs you are shown of the horrible rise in CO2 levels are a blow up of the graph of the last 100 years. Mankind has nothing to do with the oscillation of the temperature, CO2 and methane. This phenomenon is multi-variate and much like the proverbial question of what came first the chicken or the egg. What we can infer from this graph is that the increase in temperature occurs before CO2 increases. Some climatologists have said it is the activity on the sun that is responsible for the temperature changes. I wonder if anyone has compared the temperature of the earth’s core with the activity of the sun. Could be also be heating from within? This oscillation of temperature and CO2 has been going on for hundreds of thousands of years. In my opinion our industrial activities of the last 150 years cannot be the cause of the rise in CO2 levels. We are experiencing a global climate change but it changes all the time. What is normal? How would we really know; we have not been recording weather data for more than 115 years. Do not get dragged into this self-serving argument. We are not as significant as a volcanic eruption or a tsunami.